Graphene, a 2D carbon material tagged as the “strongest material” that forms a honeycombed lattice structure has found profound application in biomedical field owing to its exciting physico-chemical properties. It has raised global acceptance and enthusiasm in scientific community due to its versatile properties such as high electrical conductivity, mechanical strength, thermal stability and large surface area. Graphene is going to revolutionise recent scientific era with its potential application level strategies in medicine, electronic devices, biomaterial science and technology. As a result, there is a remarkable chance of graphene and its derivatives exposure to the biological system evoking adverse effect either accidentally or intentionally. Limited data availability on the biocompatibility of graphene upon interaction with the biological system suggests the essentiality of in depth studies on the same. Though in vivo toxicity studies on graphene have been reported, most of all concentrated on pristine graphene and graphene oxide. 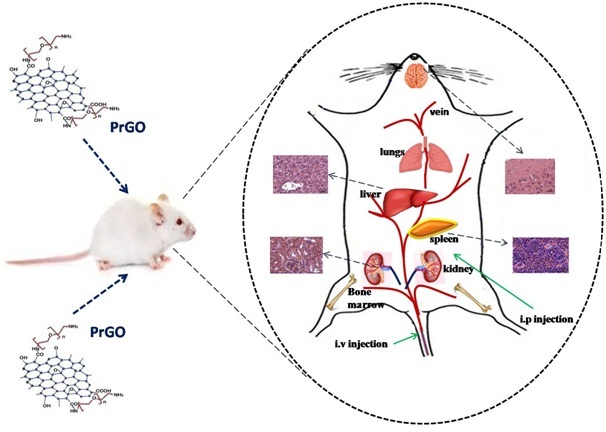 So, herein reported an in depth biocompatibility study involving bio-distribution, blood clearance and systemic toxic responses induced by PEGylated reduced graphene oxide (PrGO) after intraperitoneal (i.p) and intravenous (i.v) administration in mice. Fig. 1. Biological consequences of PrGO. Biological applications of reduced Graphene Oxide (rGO) are usually impeded due to its strict hydrophobic nature which further leads to close aggregation. Therefore PEGylation was found to be an effective strategy to get adopted in order to prevent the same. Various physico-chemical sophisticated characterisation techniques confirmed effective PEGylation as well as confirmed the size and thickness in the range of nanoscale. Cellular uptake of PrGO was confirmed in bone marrow mesenchymal stem cells (MSCs) using TEM and found efficient cellular uptake. Bio-distribution studies by confocal Raman microscope gives evidence that PrGO was distributed in major organs like brain, liver, kidney, spleen and bone marrow following both i.v and i.p injection (Fig. 1). Even though no changes were observed in body weight of the animals, gross examination revealed deposition of PrGO at various sites. Changes in haematological and clinical parameters during initial time of exposure suggest possible cell injury. Enhanced splenocyte proliferation is an indication of early immune response which eventually slows down. Histopathological analysis suggested possible liver injury. Moreover least amount of PrGO in urine suggests that kidney cells fail to completely eliminate the same. Finally all these evidences critically pointed out to the fact that surface modifications cannot completely eliminate toxicity induced by graphene. In conclusion, PrGO should undergo intensive safety assessment before validated to be safe for biomedical application. Raman spectroscopy for the detection of organ distribution and clearance of PEGylated reduced graphene oxide and biological consequences.